Semrock, Inc., of Rochester, NY, and Invitrogen Corp., of Carlsbad, CA, today jointly announced the introduction of two new products that work optimally together: the Molecular Probes® Qdot® 625 nanocrystal fluorescent label, and a perfectly matched BrightLine® fluorescence filter set from Semrock. This new label-filter combination allows the ultimate in brilliant imaging or quantitation by combining Invitrogen's stable and technically advanced Qdot® nanocrystal fluorescence labeling technology with Semrock's matched "no burn out" high performance fluorescence filters. Qdot® fluorescence labeling products exhibit revolutionary imaging performance that comes from their robust nanocrystal structure combined with a customizable surface for a wide range of biological applications. "The new Qdot® 625 streptavidin conjugate not only fills an important spectral gap for dense multi-color imaging experiments, but it also exhibits incredible brightness – even more than our longer-wavelength Qdot® nanocrystals," said Dr. Stephen Chamberlain, Senior Product Manager at Invitrogen. "Coupled with Semrock's new high-brightness matched fluorescence filter set, these products make an unbeatable combination for demanding experiments such as live-cell, single-molecule dynamic imaging." All Qdot® labels are not only bright, but also inherently photostable, making them ideal for applications that require high sensitivity and long-term photostability. "Semrock's 'no burn-out' Ion Beam Sputtering optical filter technology is a natural fit for the photostable Qdot® labeling technology. And we are proud to have been selected by Invitrogen – the leader in fluorescent labeling technology – to provide a complete solution for this important new wavelength," said Semrock's CTO, Dr. Turan Erdogan. The new optical filters in this set have high transmission and steep edges coupled with a carefully optimized and narrow emission passband to match the new 625 nm Qdot® nanocrystal, while achieving minimal crosstalk from all neighboring Qdot® nanocrystals. 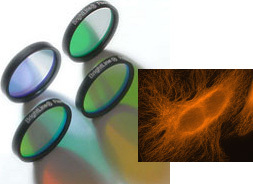 Typical of Semrock's BrightLine fluorescence filter sets, this new filter is available immediately from stock. Every Semrock filter, without exception, is made with hard dielectric optical coatings for permanent, "no burn-out" performance. Semrock manufactures, in high volume, quality optical filters that set the standard in performance and reliability for the biotech and analytical instrumentation markets. Semrock's patented and patent-pending products include the highly acclaimed BrightLine series of fluorescence filters for research, general purpose and clinical microscopy, high-throughput screening, real-time PCR, and other fluorescence-based instrumentation; exceptional filters for Raman spectroscopy; and other unique laser analytical instrumentation filters. Semrock's innovative products are made possible by combining modern ion-beam sputtering with Semrock's proprietary volume manufacturing technology. Founded in September 2000, Semrock is based in Rochester, New York, a well-known center of optics, and has sales offices throughout the United States. For additional information about Semrock, its products, and its team of international distributors, visit the company website at www.semrock.com. Invitrogen Corporation (Nasdaq:IVGN) provides products and services that support academic and government research institutions and pharmaceutical and biotech companies worldwide in their efforts to improve the human condition. The company provides essential life science technologies for disease research, drug discovery, and commercial bioproduction. Invitrogen's own research and development efforts are focused on breakthrough innovation in all major areas of biological discovery including functional genomics, proteomics, bioinformatics and cell biology -- placing Invitrogen's products in nearly every major laboratory in the world. Founded in 1987, Invitrogen is headquartered in Carlsbad, California, and conducts business in more than 70 countries around the world. The company is celebrating 20 years of accelerating scientific discovery. Invitrogen globally employs approximately 4,700 scientists and other professionals and had revenues of more than $1.15 billion in 2006. For more information, visit www.invitrogen.com. Semrock and BrightLine are registered trademarks of Semrock, Inc. Molecular Probes and Qdot are registered trademarks of Invitrogen Corp.